What can be done to improve transparency and fight against corruption in Germany? must arm themselves with the power knowledge gives. Summary: Germany has to improve the federal FOI law, adopt FOI laws in 5 federal states (Bundesländer), ratify CoE and UN conventions against corruption, improve transparency of funding of political parties and join the Open Government Partnership to catch up with Europe, America, OSCE, OECD, G 20 and BRIC states (see appendix K: weakness no. 2, 3, 4, 8, 34, 35 and 52 of National Integrity Report Transparency Germany). The human right of access to public documents (ICCPR, ECHR) is recognized as precondition for democracy and essential in the fight against corruption. 10 years ago development showed (Appendix G: Will Germany abandon Freedom of Information? Appendix H: Banana Republic Germany), that Germany was least developed in Europe. Now many countries outside Europe are more advanced then Germany looking at transparency and fight of corruption. 88 states with approx. 5.5 billion inhabitants i. e. 78% of the world population give better access to information then the federal Freedom of Information Law in Germany (http://www.rti-rating.org/country-data/). 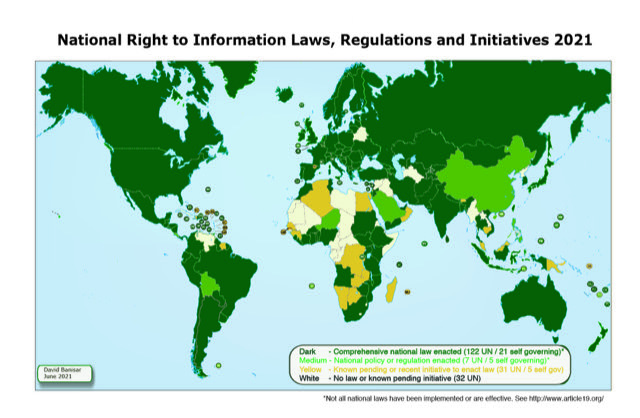 More then 115 states (http://right2info.org/laws) with more then 5.9 billion inhabitants i. e. 84 % of the worlds population adopted FOI laws or provisions in constitutions. 5 German states with half of the population lack FOI laws. 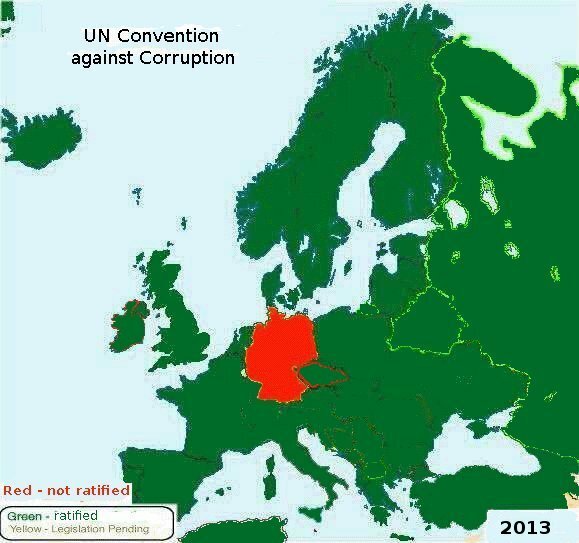 The UN Convention against Corruption is ratified by more then 159 states with more then 6,5 billion inhabitants, but not by Germany (Appendix A). Germany did not ratify the Criminal Law Convention on Corruption and does not follow Recommendation Rec(2003)4 on common rules against corruption in the funding of political parties and electoral campaigns of the Council of Europe as GRECO (Group of States against Corruption) suggested 4 December 2009 (Appendix B, Appendix C). Germany is the only state in Europe which has not ratified any of these to conventions against corruption (Appendix D). GRECO (Group of States against Corruption) concludes 29. December 2011 in report Greco RC-III (2011) 9E that Germany has implemented or satisfactorily dealt with only four of the twenty recommendations contained in the Third Round Evaluation Report (Appendix 3). Germany has to report on progress 30. June 2012 at the latest. But nothing happened up to now. 51 states participate in the Open Government Partnership for transparent accountable governments. This OGP initiative wants governments to commit to openness, participation for citizens, fight against corruption and use of new technologies. But Germany does not participate, even it would be very necessary. Germany has to improve the federal FOI law, adopt FOI laws in 5 federal states (Bundesländer), ratify CoE and UN conventions against corruption and improve transparency of sideline jobs for members of parliaments and funding of political parties to catch up with other states in Europe, America, OSCE, OECD (see weakness no. 2, 3, 4, 8, 34, 35 and 52 of National Integrity Report by Transparency Germany). But how does Transparency Germany come to the overall conclusion: Germany gets good to very good testimony, concerning anti-corruption prevention and repression: ("Insgesamt wird Deutschland ein gutes bis sehr gutes Zeugnis zur Korruptionsprävention und –repression ausgestellt"). Here is a human right missing which is a precondition for democracy. Complaint against refusal of access of the reasons why Bavaria does not meat the suggestions of the CoE Human Rights Commissioner (Appendix 2). "The right to access information held by public authorities is a fundamental human right which should be given effect at the national level through comprehensive legislation (for example Freedom of Information Acts) based on the principle of maximum disclosure, establishing a presumption that all information is accessible subject only to a narrow system of exceptions." The federal FOI law violates the principle of maximum disclosure. 5 federal states violate the human right of access to public documents. i. e. no FOI law is adopted. The UN Human Rights Committee decided that the International Covenant on Civil and Political Rights (ICCPR) Article 19 (3) recognizes the right of individuals and the media to receive state-held information without requiring a demonstration of direct interest (Appendix L). The European Court of Human Rights recognizes the human right of access to public documents (Appendix M). The CoE Human Rights Commissioner suggested to educate administration and judges in international law and human rights (Appendix E). The refusal to give access to the reason of Bavaria not to follow these suggestions (Appendix F), shows that this suggestion is important. 21. February 2012: Access Info Europe will draw German NGOs attention to the issues raised. June 2012: The German Open Government Online Consultation http://e-konsultation.de/opengov/ refused the suggestion that Germany should join the Open Government Partnership and improve access to information according to international standards. Why? 30 January 2013: Will the Baltic Sea NGO Forum participate in the meeting between NGOs and diplomats for Germany’s UPR in March 2013 in Geneva? German Institute for Human Rights (20 February 2013): As a general policy for its participation in the UPR procedure, the German Institute for Human Rights will continue to work on the issues it has taken up in its own UPR stakeholder report. There are 269 hits (Accessed March 2013) on "Access to Information" in the UPR-Info.org database e. g. freedom of information laws are mentioned for Canada, Azerbaijan, Bahrain, Botswana, Burkina Faso, Cape Verde, Colombia, Cameroon, Cuba, Equatorial Guinea, France, Kenya, Tuvalu, Uzbekistan and the REPUBLIC OF DJIBOUTI submitted by ARTICLE 19. UNESCO has recommended Freedom of Information laws to all states reviewed during the 16. UPR session. 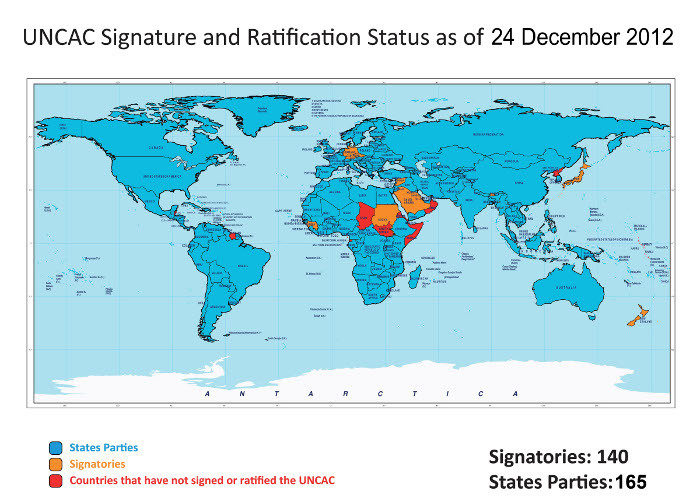 http://en.wikipedia.org/wiki/UNCAC: 160 states have ratified United Nations Convention against Corruption (UNCAC). Germany has not ratified. GRECO (09. December 2011): GRECO concludes in report Greco RC-III (2011) 9E that Germany has implemented or satisfactorily dealt with only four of the twenty recommendations contained in the Third Round Evaluation Report. Germany has to answer 30. June 2012 at the latest. Keim, Walter (7. November 2012): Will OSCE Support the Human Right of Access to Public Documents? You may link this page.